There's really not much more I can say about this dish then to say... go out and make this, right now! 1. To make the sauce, put the chiles, coriander seeds, sesame seeds, almonds, peppercorns and cloves in a mortar and pestle and crush. (I used my little whizzy chopper thing since I don't have a mortar and pestle). Tip into a skillet and dry-fry for a minute or so until lightly charred. 2. In a separate pan, fry the onion, garlic and cocoa in a little oil for 2 minutes. 3. Add the tomatoes and bring to a boil, then add the dry-fried spices, the cinnamon, sugar and stock and cook for 25 minutes. Transfer to a blender and whiz until smooth. Fold in the chocolate. 4. Preheat the oven to 400C. Coat the squash in oil and roast for 40 minutes until soft. 5. Put the squash in a bowl, add the refried beans, cilantro and red chile and stir well to mix. 6. Divide the mixture between the tortillas, roll up and put into a baking dish. Cover and cook in the oven for about 12 minutes; until warmed through. 7. 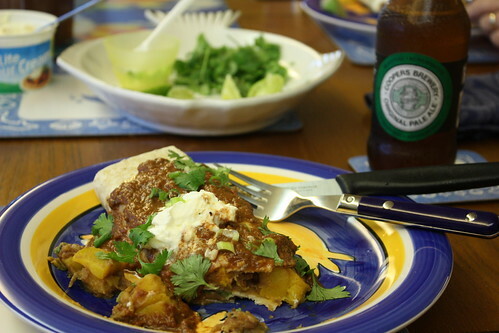 To serve, put two tortillas on each plate and spoon over some of the sauce (it's pretty heady so not too much!). Serve with some sour cream, lime wedges and cilantro. I'll be cooking dinners at home two days out of the week and I'm pretty keen to experiment with new and interesting recipes. In one of the blogs I'm following (and damned if I can remember right now which one it is, argh! ), they've set up little "themes" for choosing recipes each week. Some are pretty specific ("Citrus") and some are more open ended ("Love"). 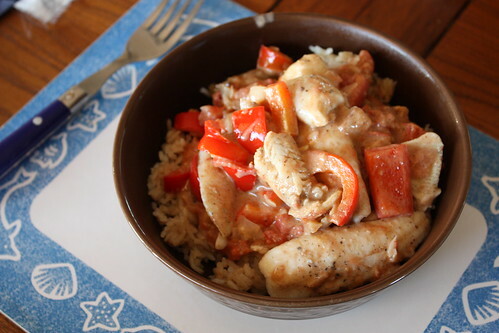 This recipe originates from the tiny island of Zanzibar, but the use of Indian-style curry shows it's history of trade. 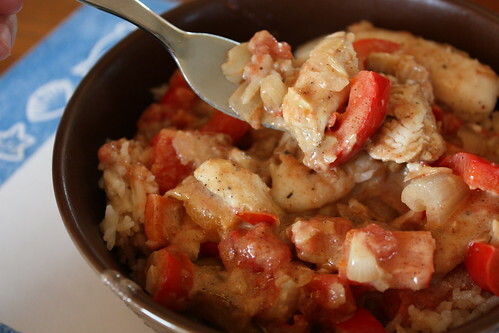 Now it's popular all along the coastal region of East Africa, and oh my goodness is it now popular in my home. I can not begin to tell you how delicious this is! 1. Heat the oil over medium heat in a large skillet. Season the fish with salt and pepper. Sear the fish on both sides and remove from heat. Do not cook them all the way through, just set them aside on a plate for now. 2. Reduce the heat to medium-low and add the onion and capsicum. Sauté until the onion is translucent. Have patience on this, it's worth it! Add the garlic and sauté for a further 1-2 minutes. 3. Add in the coconut milk, garam masala and tamarind paste. Bring it up to a boil, then turn the heat down to low, cover and let simmer for 6-8 minutes. 4. Add the fish fillets, nestle them down into the juices then cover once more and continue to simmer for a further 5-10 minutes; until the fish is cooked through. You can serve it with whatever you like! We had leftover rice, but Naan bread would have been lovely to have had as well. Please, PLEASE, try making this dish. It's easy to do, the fish can easily be substituted out with something veg-friendly, there's so little dishes to clean up afterwards and it is SO damn delicious. I seriously licked my plate clean. It's that good. It was great having my Uncle come visit for a couple of weeks, it meant I got to pretend I had a dog again for a little while. 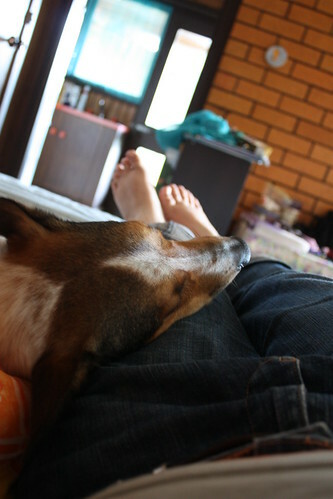 A quiet afternoon in bed with a good book and a good dog is heavenly. I have spent a good part of today listening to helicopters flying endlessly back and forth overhead. The flooding that is currently going on to the north of me has weighed pretty heavy on my head for the past couple of days. It's a horrid situation and it looks like it's not going to be improving anytime soon. I've been gathering my thoughts, maybe I'll be able to write them into something legible sometime in the near future, but for now I'm still a bit shell-shocked, I suppose. Between this and the shooting that happened in Arizona and the endless gray drizzle of rain, I've been stuck in a bit of a rut. If you are able to help at all to the poor souls in Queensland, I would encourage you to donate to the relief appeal. 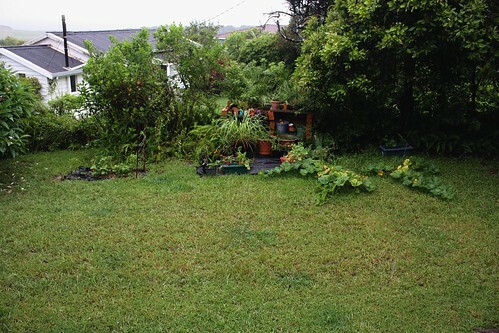 For my first month of One Small Change, my goal for January is to pay some extra attention to my garden while I have the time. I have been enjoying quite a few surprising successes (as well as a few failures) and my garden is producing nicely right now. I'd like to make it even MORE productive, though, including trying new plants as well as digging in a whole extra veggie bed to fill with yummy things! 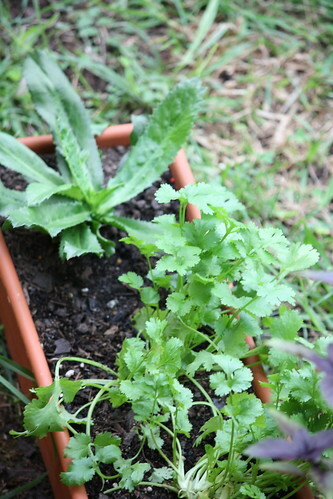 I also really want to make sure that I am picking, using and storing what I grow as well; especially with my herbs. In the past I have not been storing as much as I could have and therefore a lot of my plants have gone to "waste". The one major hitch to my plan at the moment is this endless, heavy rain we've been getting! We're scheduled to get several more days of it yet as well... but I'm hoping soon I'll get a couple of dry days in so I can get this new veggie patch in! 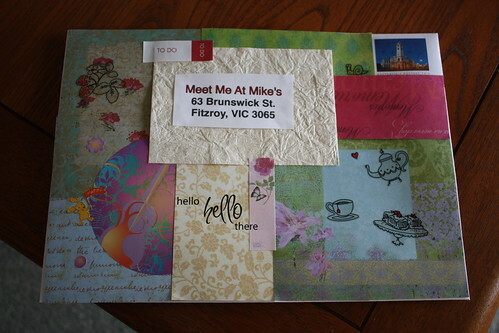 Meet Me At Mike's is a craft shop in Melbourne. 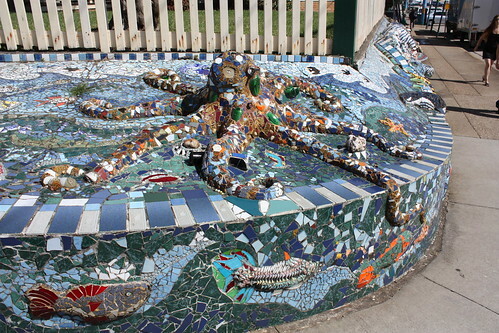 I know about them because of the fantastic blogging done by owner Pip. When I get down to Melbourne, this shop is one of the places I intend to seek out first! I discovered Pip was holding an Envelope Project calling for people from all over Australia and the world to mail in decorated envelopes to display in her shop window I knew I wanted to participate! I've been super busy of late (thus the quietness on my end) so a couple of hours break with mindless crafting was exactly what I needed. This is what I ended up with. Everything came from my stash, in fact most of it was just me using up the rest of bits and pieces I had. A good reminder on why I hang on to all this stuff! 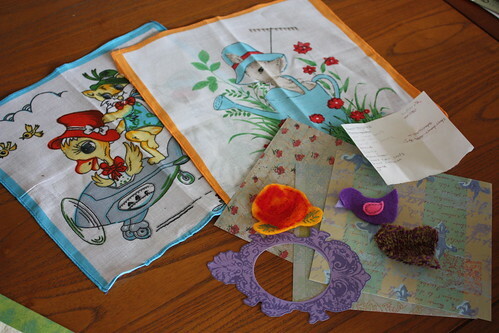 We were encouraged to fill the envelopes with some interesting things; bits of fabric, papercraft things, paper scraps, etc. Here's what I sent down. Mostly just some leftover scrapbooking stuff I have floating around, a little knit heart and felted rose, that week's grocery shopping list and some really kitchy hankies that were excess in an opshop find. A little bit of me hanging up in Melbourne on display. 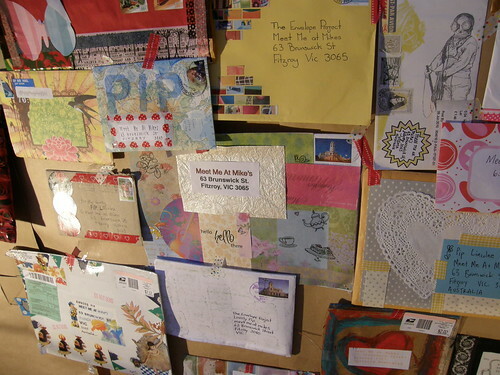 You can see more of the gorgeous submitted envelopes and the whole display on Pip&apos;s Flickr Stream. If you happen to be in Melbourne, go check it out! 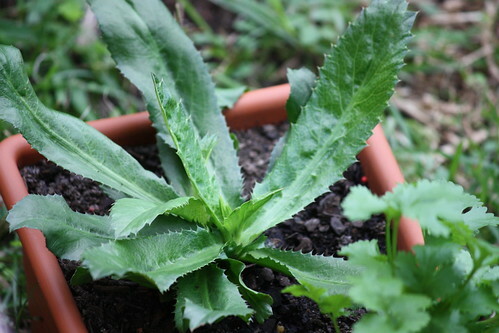 It has very thick, fleshy leaves and very, very spikey margins (almost like a thistle!) But they smell and taste exactly like the more delicate coriander plants! I love them, because these are so hardy, and they're perennial. Just chop them up finely just like you would regular coriander and cook away! Hanging out with his more delicate coriander buddy. Coriander is such a hit or miss for me in terms of growing; they're notoriously difficult though and certainly they don't seem to last very long (I guess my family and I cook with them too much) but this perennial version is really doing fantastic. So well in fact that I bought myself a second one the other week! 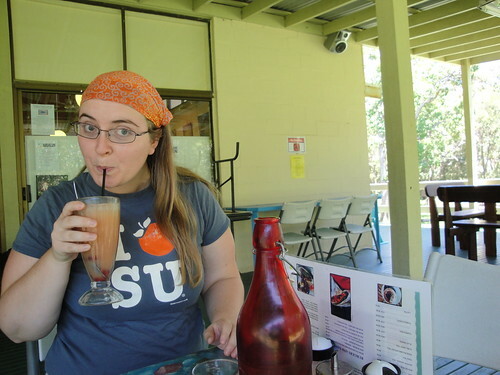 The very last part of our little get-away was a stop in Nambucca. We had some time to kill before our reservation though, so we took a little stroll through town. The next morning we were up early with the sunrise. We were heading to the highlight of the trip. Mum and I had come across the Valley of the Mist farm in my latest Australian Permaculture magazine. Valley of the Mist is a farm run by a couple (Dennis and Marilyn) in Macksville. 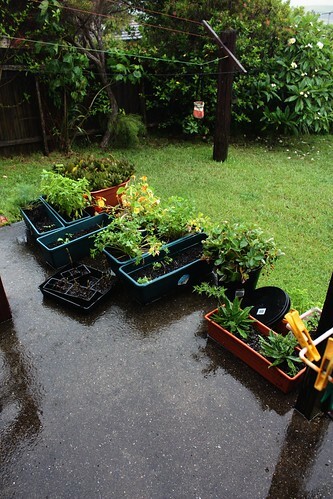 They grow Australian bush food for market; Lemon Myrtle, Lilli Pillis, Davidson Plums, Finger Limes and a dozen others. Not only that, though. 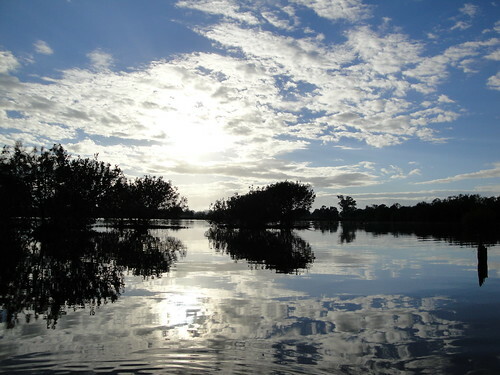 But their property includes this incredible wetland ecosystem with a wealth of unique plants and animals; including the largest nesting colony of black swans in this part of Australia. Dennis was kind enough to paddle us around in his canoe. There are no words for this experience. It was simply amazing. I'll let my photographs do the talking for me.